25 Feb 2014. 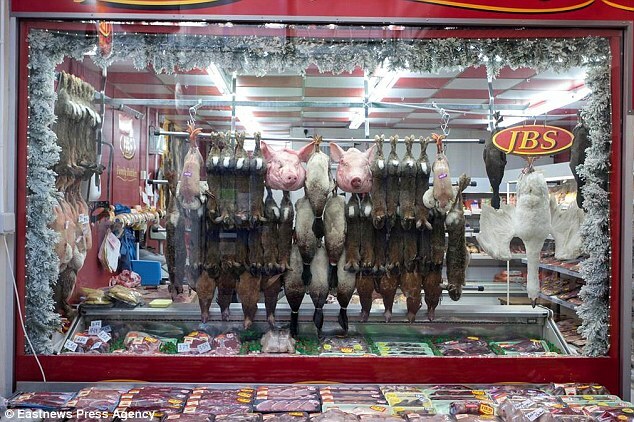 Comment piece published in the Daily Mail (original here): A high Street butcher in Suffolk has been forced to take down its window display, as shoppers are said to be offended by the sight of bits of dead animals. Hanging pigs’ heads, limp rabbits and dead pheasants were upsetting the children. The story is ludicrous. But such silliness is indicative of something disturbingly wrong in our nation’s culture. 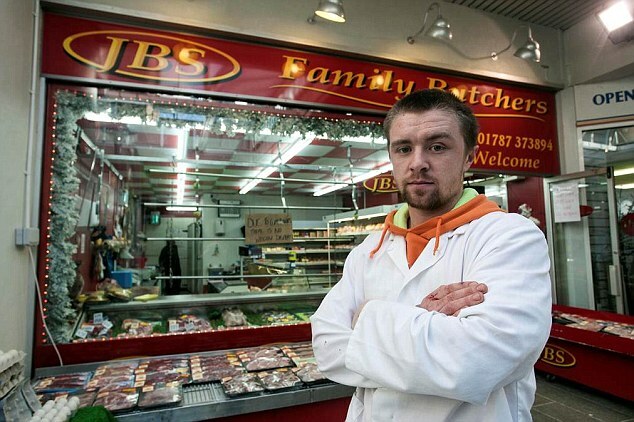 The senseless twits behind the hate campaign mounted against JBS Family Butchers of Sudbury say they are trying to protect their children from the ugliness of ‘mutilated carcasses’. This seems implausibly puritanical. Any child with internet access and a stack of video games will have seen far worse. These sentimental folk are part of an ever-growing collective ignorance about food and farming that is immensely damaging not only to the countryside, to farming and to animals — but also to ourselves. Our lack of understanding of where food really comes from is helping to create mountains of food waste and a population of fat, unhealthy Britons. We should not underestimate the scale of that ignorance. Last year, a survey of 27,500 children by the British Nutrition Foundation found that almost a third of those aged five to 12 thought fish fingers came from chickens or pigs. One secondary pupil in five didn’t know where potatoes came from. Ten per cent thought spuds grow on trees. If you’re shocked by those figures, consider this: 80 per cent of the secondary school pupils surveyed had been on a ‘farm visit’, presumably arranged to counter lack of understanding of food and its sources. Few of us today spend time thinking about where our food comes from. It arrives on supermarket shelves or over the fast-food counter without any traces of its origin. There’s no mud on our salad or root vegetables. Most fruits are so perfect, glossy and uniform, they might have been made in a factory. Butter comes wrapped in foil and a cut of steak or a chicken thigh is sold in a plastic tub covered with plastic film. Is it any wonder that some people, confronted with the visceral reality of an old-fashioned butcher’s window, take fright? But there is a curious double standard at work. While we recoil at the sight of a pig’s cheeks or a pheasant, we are happy to put meats of much stranger origin in our mouths: ready meals full of chemicals, sugar and preservatives, even cheap ‘beef’ dishes that turn out to have been made from horses. The consequences of our ignorance about food’s origins are far-reaching. First, there is the waste. The average UK family loses £60 a month throwing away usable food — nearly a meal’s worth a day. And supermarkets reject huge amounts of food because it doesn’t look right. Retailers say they are only catering for our inability to tolerate anything not recipe-book perfect. In a refreshing bout of honesty, Tesco admitted recently that nearly half its bread products, more than two-thirds of its bagged salads and 40 per cent of its apples are thrown away. Yet this food is good and healthy. Neither Tesco nor any other store has admitted what weight of edible parts of animals are chucked out. Yet there is little of a farm animal, other than the hide and bones, that cannot pleasurably be eaten. As the chef Fergus Henderson says: ‘If you’re going to kill an animal, it seems only polite to use the whole thing.’ But British butchers use less of an animal than their European counterparts — half a pig’s weight, whereas an Italian butcher will make meals out of 70 per cent of the carcass. I’ve watched the Michelin-starred chef Andrew Fairlie preparing one of his most popular dishes — a ‘plate of pork’. It was a spread of delicious, old-fashioned treats: black pudding, smoked pork belly, a terrine made from the pig’s cheeks and tongue, and cuts from the head. ‘Any self-respecting chef should be using as much of the animal as possible,’ he said. One of the window-display horrors that the good people of Sudbury complained about was a pig’s head. These are usually thrown away now, though for our ancestors they were a treat. Think of the ancient carol The Boar’s Head, which describes a great Christmas feast, and the many pubs named after it. The second consequence of our ignorance concerns animal welfare. 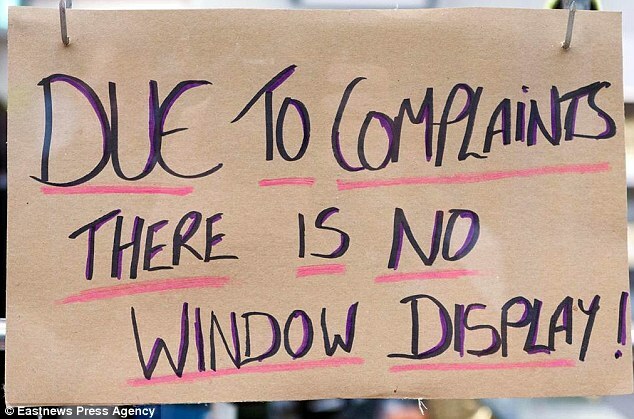 Those animal-lovers who object to seeing carcasses of birds and occasional pig parts in butchers’ windows are guilty of a grim sort of hypocrisy. Anyone who truly cared about animals would support any butcher who used whole animals. Our squeamishness is a driving factor in two evils: cruelty to animals and damage to the environment. Choosy consumers who will eat only the lean meat from animals at the bargain prices we demand have driven livestock farming into a crisis. It is not possible for modern farming to keep animals in a traditional and kind way while supplying a narrow range of cheap cuts. Ninety-five per cent of the chickens and almost all the pigs we eat are raised in factory farms, where conditions would appal anyone with any feeling for animals. The image of Daisy the Dairy Cow, happy in a green meadow, is becoming a myth. The new milk-factory super-farms, common in the U.S., and arriving here, house cows that never see daylight and die after just four years of production. All so we can have a cheap pint of milk. A third of British pig farms have gone out of business in the past ten years and we now import 60 per cent of our pork from Europe, where pig welfare standards are much lower. The third point is that eating like this is bad for us. Rather than cooking from scratch with cuts of meat from a local, trusted butcher, we buy cheap meat from unknown sources, sold to us with added salt, preservatives, flavourings, colourings and fatty, sugary sauces. This does none of us any good at all and has helped to fuel our obesity crisis. As we know, British children are toured around farms on school outings but many remain uncertain of the link between an egg and a chicken. More needs to be done. A few years ago, concerned that our own urban children were growing up just as ignorant, my wife and I decided to keep a ‘remote pig’. So with the help of a friendly farmer just outside Edinburgh, where we live, we adopted a piglet. We visited him fortnightly, often bringing chocolate. It was a bit like having a child at boarding school – in slightly more friendly conditions. Fond as we were of the pig, there was no sentimentality. The kids called him Crispy Bacon. And a year later the family assembled in the butchering shed as we turned the grown-up piglet into a freezer-full of delicious roasts — and sausages and bacon. We were pleased — and so was the farm. It now has a wider adoption programme to help other city families be remote meat-producers. It’s fun, the meat is a bargain and we have learnt a new respect for farmers and animals. Getting back in touch with the land and the origins of our food is good for us, for the economy and for Britain. Ignorance, of the sort shown by the silly shoppers of Sudbury, is causing untold damage to our farming traditions and the animals those shoppers purport to love. Alex Renton is author of Planet Carnivore: Why Cheap Meat Costs The Earth (Kindle and iBook, £1.99). Excellent article as usual from that Alec Renton. He speaks real sense about meat and animal welfare. Keep it up, Alec. I remember when our butcher had full sides of cow in the window. After over 100 years it closed during the recession and while there were many factors to its closure, one big one was that more and more people were put off by the display. That, the recession, the reluctance of the new generation of the family business, and the fact that Tesco was two doors down made it impossible to stay open. The new butcher has done a pretty good job towing the line between authenticity and modern squeamishness. But I’m so glad this conversation is still going on even if it seems like we’re fighting a losing battle. I had a friend turn to me and actually say she didn’t want to know where anything came from full stop! I particularly liked your point that relocalisation is beneficial for health and for the economy. The more folk speak on the matter the higher chance (hopefully) people will start listening. It worked in the 60s! I’m definitely going to check out the ebook. Thanks for posting! It worries me that people don’t know and don’t want to know where their food comes from. We claim to be a nation of animal lovers but accept the dreadful lives of factory chickens and the disrespectful waste of the animals that feed us. The effects on our own health are huge; if people knew that they would be much healthier with grass-fed beef and free-range chickens and pigs, surely they would want to buy them – wouldn’t they?